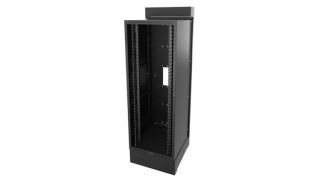 The What: Middle Atlantic Products has expanded its SR Series of Pivoting Wall Racks with a new wider model to provide integrators with more space to manage high-density cable bundles. The What Else: Originally developed to combine the advantages of a floor-standing enclosure and wall-mounted cabinet in one unit, the SR Series provides the improved rear access and space savings of a wall rack via a swing-out cabinet section that pivots on a weight-bearing floor base. The Wider SR Series takes into account that systems are evolving as equipment continues to increase in capability and decrease in size, offering integrators a different option for mounting systems closer to the point of use. Within a seismic-certified enclosure, the new Wider SR Series Pivoting Wall Rack is available in 24 RU, 40 RU, and 46 RU options. Featuring the SR Series' pivoting floor base, this solution saves an average of 9 square feet per cabinet, which is well suited for compact spaces that have a smaller footprint and do not require clearance at the rear of the cabinet, saving aisle space. The rack also incorporates Middle Atlantic's built-in cable management and tool-free QuickMount system for center section mounting. "Middle Atlantic offers the broadest range of wall racks—all optimized for low-voltage applications and all designed to facilitate efficient, reliable installations,” said Paul Dolynchuk, director of product management, Middle Atlantic. “This wider enclosure fills out our SR Series by answering requests from consultants and integrators for additional cable accommodations. Offering more options for cable-intensive installations, such as multidiscipline, high-capacity scenarios where AV, data, and security equipment need to be housed together, this new solution helps ensure more reliable systems and better end-user experiences without added complexity or cost."